The iconic Krugerrand celebrated its 50th anniversary in 2017. To celebrate the enduring value of this trusted and legendary gold coin, the Krugerrand range was extended with new sizes and metals. Following the success of this extended range, in 2018 we bring you some of the popular new sizes from 2017, and introduce yet another new size: the 2oz gold coin. The silver proof Krugerrand also makes a return. 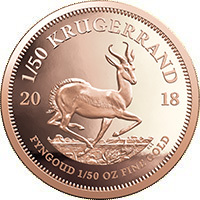 As with the original gold coin minted on 3 July 1967, the 2018 gold Krugerrand range bears the classic springbok design on the coins. The 2oz gold proof Krugerrand is the newest addition to the range. The 1oz silver proof Krugerrand was first released in 2017, as part of the 50th anniversary range. Due to its popularity, the proof-quality silver coin makes a return in 2018. November 1918. 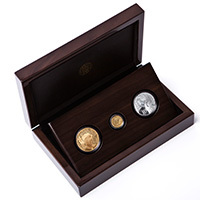 This set consists of a 1oz privy mark gold proof coin, as well as a 1oz sterling-silver medallion. The privy mark on the 1oz Krugerrand marks the 11th hour of the 11th day of the 11th month in roman numerals, and the medallion shows a poppy flower pattern design. 2018 marks 100 years since the birth of Nelson Mandela and we are proud to honour his legacy with a new coin range. 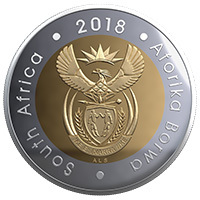 The new coins are the second installation in the “Celebrating South Africa” theme, through which we celebrate milestones and symbols of South Africa’s freedom, democracy and culture. 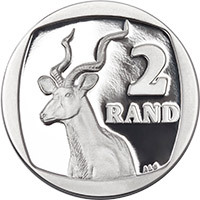 The first coin series in this theme was the 2017 OR Tambo Centenary range (see 2017 coin range). 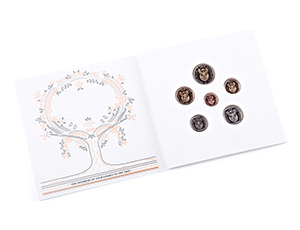 Each meticulously crafted coin allows us to look back at the remarkable stages of Mandela’s life, and his struggle for justice, human rights, and a free and democratic South Africa. 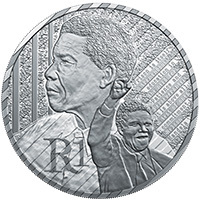 This coin depicts Nelson Mandela as a proud statesman. After spending 27 years in prison, Nelson Mandela was ﬁnally released on 11 February 1990 and elected deputy president of the ANC in the same year. In 1993, he shared the Nobel Peace Prize with President FW de Klerk before making history as South Africa’s first democratically-elected president, in 1994. 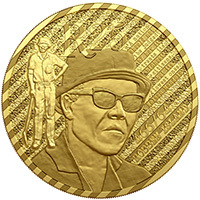 This 1oz gold coin portrays Nelson Mandela in his latter years, post-presidency. In 2009 the United Nations declared July 18 as ‘Nelson Mandela International Day’ in recognition of his contribution to the culture of peace and freedom. Nelson Mandela passed away at the age of 95 on 5 December 2013, leaving behind an inimitable legacy. 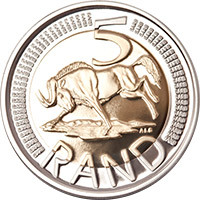 The bimetallic R5 circulation coin is central to this range, enabling the South African public and coin collectors to celebrate the centenary year of Mandela’s birth. 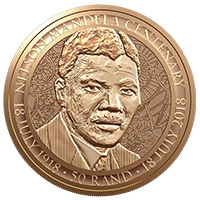 The coin goes into circulation in July 2018, the month in which Mandela was born. 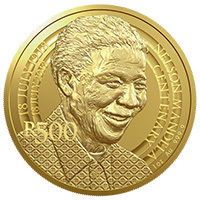 A collectable R5 coin will be included in the 3-coin and 4-coin Mandela Centenary sets. The collectable R5 is NOT available for purchase on its own. 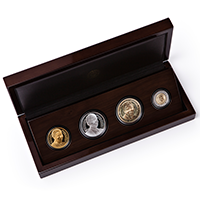 This special launch set is the final instalment in the Nelson Mandela Centenary coin range, offering collectors one more opportunity to own the R500 1oz, 24ct gold coin. Available in a limited edition of 100, each set represents one year of the centenary. 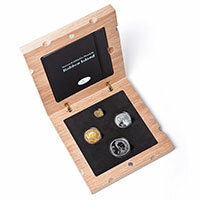 Each set consists of a R500 1oz pure-gold coin featuring a “100” privy mark on the reverse, as well as a sterling-silver medallion featuring the official logo of the Nelson Mandela Centenary and the individual number of the set on the reverse, and the logo of the South African Mint together with the hallmark and a quote from Mr. Mandela’s autobiography, ‘The Long walk to Freedom’ on the obverse. 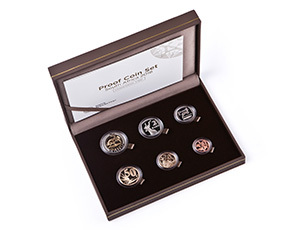 This set consists of one of all the Nelson Mandela commemorative coins: a 1 oz pure-gold R500 proof coin, a 1 oz sterling-silver R50 proof coin, a bronze alloy R50 non-circulating legal tender coin along with a proof quality R5 commemorative coin. 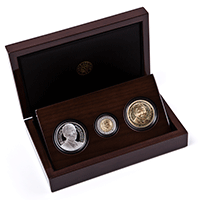 This set consists of three of the Nelson Mandela commemorative coins: a 1 oz sterling-silver R50 proof coin, the bronze alloy R50 base metal coin and the proof quality commemorative R5 coin. 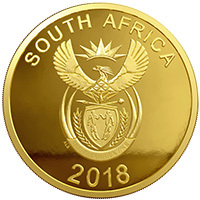 The obverse depicts the national coat of arms, the year of issue ‘2018’, and the word ‘South Africa’. 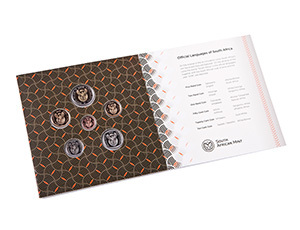 The obverses of the silver and bronze alloy coins depict the national coat of arms, year of issue ‘2018’, and the words ‘South Africa’ written in all the official languages. 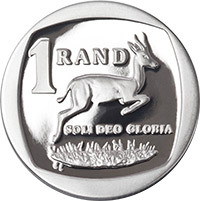 The obverse depicts the national coat of arms, year of issue ‘2018’, and ‘South Africa’ written in both English and SeSotho. The 2018 South African Inventions theme is Computed Tomography (CT), invented by Allan McLeod Cormack. The CT is an imaging procedure that uses special x-ray equipment to create detailed pictures or scans of areas inside the body. It is also termed computerised tomography and computerised axial tomography (CAT). The ‘South African inventions’ theme was launched in 2016, to highlight globally relevant inventions and firsts by South Africans. The dolos was the first invention to be featured, followed by the first successful human-to-human heart transplant in 2017. 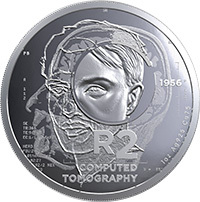 The reverse of the R2 crown a human head indicating the area to the scanned, the denomination, the words ‘Computed Tomography’, and the year ‘1956’. 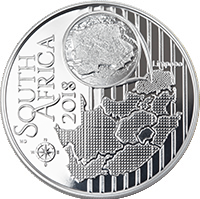 The obverse features the coat of arms of South Africa, the year ‘2018’, and the words ‘South Africa’ in all the official languages. 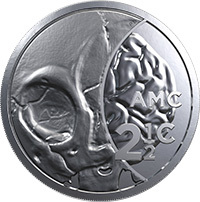 The reverse of the 2½ c tickey shows the different layers and tissue densities that can be distinguished with a CT scan, the denomination, and ‘AMC’ for Allan McLeod Cormack. 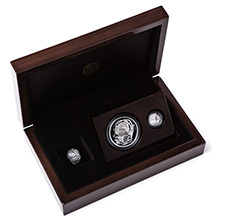 The 2018 sterling-silver Crown and Tickey set includes a R2 crown-sized coin, a 2 ½c Tickey coin and a stunning sterling-silver model of a human brain, packaged in a beautiful piano finish varnish, walnut wood box. The Crown obverse depicts the coat of arms of South Africa, the year ‘2018’, and the words ‘South Africa’ in all the official languages. 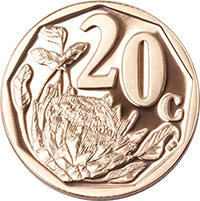 The Tickey obverse features the words ‘South Africa’, the year ‘2018’ and a King Protea. 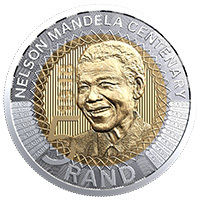 The ‘Life of a Legend – Nelson Mandela’ Protea series was introduced in 2013, representing a different chapter of Nelson Mandela’s life on each year’s coin issue. The 2018 edition features his 27-year incarceration and eventual release. 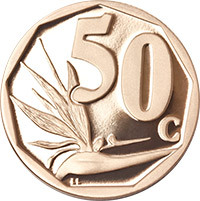 The R25 (1oz) reverse features a quotation, the words ‘Robben Island’ and Mandela’s prison number while incarcerated on Robben Island ‘466/64, while the obverse shows Mr Mandela underlined by a wreath of King Protea and the year 2018. 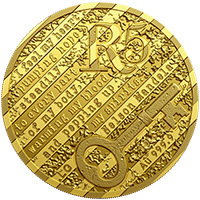 The R5 (1/10 oz) 24ct gold coin comprises of the quotation: ‘I feel my heart pumping hope steadily to every part of my body, warming my blood and pepping up my spirits,’ taken from a personal letter that Nelson Mandela wrote to his wife, Winnie Mandela, in 1970, while she was incarcerated in Pretoria Central Prison. 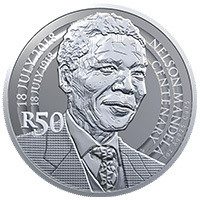 The reverse design of the silver uncirculated coin is exactly the same as that of the silver proof coin: it features the denomination of R1 and images of Nelson Mandela looking through the barred window of his Robben Island prison cell and the image taken shortly after his release from Victor Verster Prison. 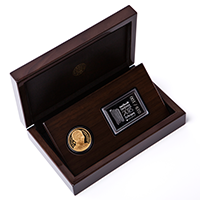 This 2018 prestige set consists of a 1 oz 24ct gold coin and a 1/10 oz 24ct gold coin, as well as a R1 sterling-silver coin, each featuring different developments in Nelson Mandela’s 27-year incarceration and eventual release. The special edition launch set consists of a privy mark pure-gold R25 (1oz) coin, a privy mark pure-gold R5 (1/10oz) coin, a sterling-silver R1 proof coin. 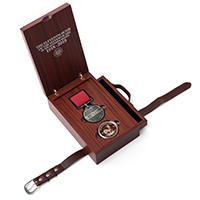 It also consists of a special sterling-silver medallion. 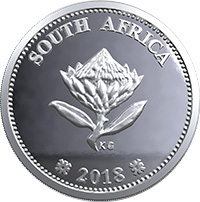 The common obverse features Mr Mandela wearing one of his iconic Madiba shirts, underlined by a wreath made from South Africa’s national flower, the King Protea, and the year 2018. Each coin in this set depicts a different Archosauriform, together with its scientific name, the word ‘Natura’, the denomination, mass and metal value of the coin. 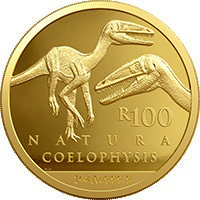 The 1oz R100 coin features the Coelophysidae which were highly successful primitive theropod dinosaurs that lived worldwide from the late Triassic to early Jurassic. Coelophysis rhodesiensis, a small, agile dinosaur which preyed on small animals, inhabited South Africa and Zimbabwe during the early part of the Jurassic period. This slenderly built, bipedal dinosaur grew up to 3 m long and weighed about 32 kg. 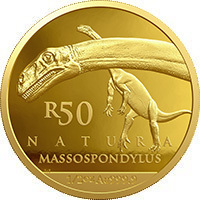 Depicted on the R50 is the Massospondylus carinatus, one of the best known dinosaurs in the world and also the most common dinosaur species in Southern Africa. Massospondylus is a prosauropod dinosaur and lived in the early Jurassic period, which makes it one of the oldest dinosaurs on earth. It had a typical saurischian type pelvis with a forward-jutting pubis. Its length was 4 m to 6 m and it had a small head, narrow body and long neck and tail. Its hind limbs were much longer and stronger than its front limbs which, together with the morphology of the hips, indicate that it was a bipedal. The small serrated leaf-shaped teeth suggest it was probably an omnivore. 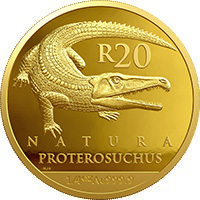 The Proterosuchidae, similar in form to the crocodile, is depicted on the R20 ¼oz gold coin. Proterosuchus ranged between 1.5 m to 2.2 m in length, and resembled the crocodile with their long jaw, short legs, thick neck and a long flattened tail. The elongated snout of this creature resembles that of a modern gharial, more than that of a crocodile or alligator which would suggest that it was a specialised fish-eater. Its nostrils are on the side of the snout, supporting the hypothesis that they were terrestrial predators hunting in water. Erythrosuchidae were Archosauriforms from the late Triassic of South Africa and Namibia. The Erythrosuchus africanus was approximately 5 m long and stood over 2 m tall, making it the largest predator of the time. The Erythrosuchidae would have been at the top of the food pyramid, preying on all other terrestrial vertebrates. The Erythrosuchus had an exceptionally large skull for its size, occupying approximately a fifth of its total body length. Its teeth were as large as that of any large carnosaur, but curved like those of other Archosaurimorphs, suggesting that they preyed upon large prey animals which were difficult to subdue. This creature walked on all fours with a semi-erect gait which would have enabled it to move more swiftly than other more primitive reptiles of the same size. It would still have been a cumbersome animal given its size and for that reason it is speculated that it was an ambush predator. Euparkerids are Archosauriforms from the Middle Triassic of South Africa, Namibia, Poland and China, and is pictured on the R5, introduced to the range in 2018. Euparkeria capensis, a small active predator, which could at speed run bipedally, had a protective double row of osteoderms along the length of its body like many other Archosauriforms. The size, agility, speed and small sharp teeth of Euparkeria would have made it ideally suited to be an insectivore. Euparkeria was one of the first bipedal vertebrates with their legs longer than their arms, which suggest that they could move around quadropedally, but at times, such as when they were running, they could become facultative bipeds and run on their hind legs. Bipedalism became a very important evolutionary adaptation inherited by the archosaurs, including dinosaurs and birds. 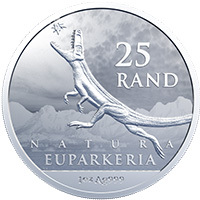 A R25 fine-silver Natura is issued for the first time in Silver in 2019, sharing a design with the smallest gold Natura coin in the series, the R5 1/20oz 24ct gold coin. Although dated 2019, this coin belongs with the 2018 Archosaur series. 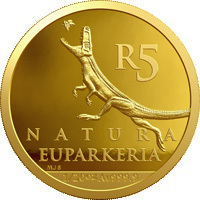 Depicted on the reverse is the Archosauriform together with its scientific name ‘Euparkeria’, the word ‘Natura’, the denomination, and the mass and metal value of the coin. This set comprised of all five gold coins in the 2018 Natura range: the R100 1oz, R50 1/2oz, R20 1/4oz, R10 1/10oz and the R5 1/20oz, each depicting a different Archosaur. The six coins share same design on the obverse, which depicts the fossilised skull, neck and shoulder of an Erythrosuchus africanus. The words ‘Rise of the dinosaurs’, ‘Archosauria’ and the year 2018 as roman numerals ‘MMXVIII’ complete the obverse design. 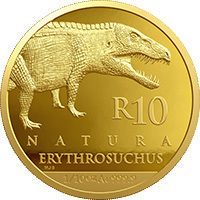 The 2018 R1 gold coin concludes the theme ‘South African Reptiles’ on the 1/10oz 24ct gold coin which began in 2015 and featured the Nile crocodile, followed by the Cape dwarf chameleon in 2016 and the puff adder in 2017. 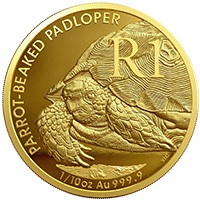 It features members of the Testudines order which is represented on the reverse of the coin by the parrot-beaked padloper (Homopus areolatus). The parrot-beaked padloper is part of a group of five species of very small tortoise endemic to southern Africa, and its species ranges from 70g to 650g in mass, while their flat rectangular carapace can vary in length from 60mm to 165mm. It is found in the coastal fynbos and is restricted to the southern Cape. Its colouration is toffee brown with yellow, orange and green, and is similar to the rocks and soil of its habitat, but during the mating season the nasal scales of the males change to a deep orange-red. Reptiles of the Testudines order include turtles and terrapins, and are characterised by a special skeletal or cartilaginous shell developed from the ribs that act as a shield. 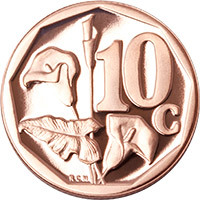 The reverse of the R1 coin depicts an intricate representation of the parrot-beaked padloper, the denomination of ‘R1’ and the metal value of ‘1/10oz Au 999.9’, together with its name. 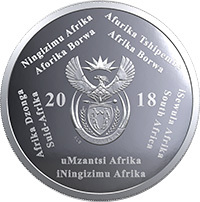 The obverse features the national coat of arms together with the words ‘South Africa’ and the year of issue ‘2018’. The most recognisable form of rock art in South Africa is the Waterberg’s San (Bushmen) rock art, and a common motif in the Biosphere is the hartebeest (African antelope). This antelope is sometimes painted with both animal and human features, and these representations are called therianthropes. 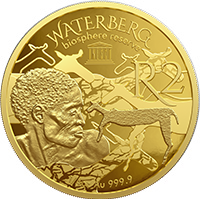 This R2 (1/4oz) 24ct gold coin features a hartebeest therianthrope. 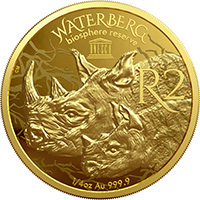 A black rhinoceros or hook-lipped rhinoceros (Diceros bicornis) mother and calf are featured on this R2 (1/4oz) 24ct gold coin. The first black rhino was introduced onto private land in the Waterberg in August 1990, and today, three founding populations of black rhinos have been established in the area, one in the Marakele National Park (WBR core area) and two on private land (WBR buffer zone). 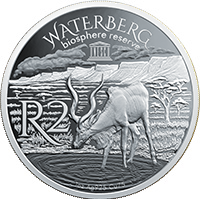 This sterling-silver R2 coin captures the open landscape of the Waterberg Bioshpere Reserve. The Seven Sisters Mountain range, an iconic feature of, and the gateway to the Waterberg, are shown with clouds gathering above in the background. 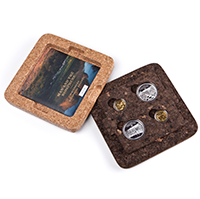 The 2018 MAB prestige set includes two R2 1/4oz 24ct gold coins and two R2 1oz sterling-silver coins packaged in an eco-friendly cork box. The obverse shows a map of South Africa with the location of the WBR within the Limpopo Province enlarged. 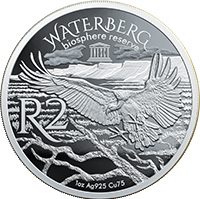 R 16 775 - UNESCO MAN AND BIOSPHERE: Waterberg Biosphere Reserve - Full Set: Two R2 (1/4oz, 24ct gold) coins and two R2 (sterling silver) coins. Laser engraved double-tone natural cork box sourced from sustainably managed Portuguese cork forests. The 2018 colour coin range represents the beautiful fauna and flora of the Waterberg Biosphere, situated in the magnificent Waterberg district in Limpopo. As the name implies, The Waterberg serves as a water reservoir for this arid region. There are four main river catchment areas which provide water to an area of over 40 000km2. The Waterberg Biosphere Reserve is an area consisting of low mountain ranges and escarpments with poor soils and a relatively low level of economic activity. Habitats are sufficiently represented to ensure that the current high biodiversity is maintained and the low human density ensures large areas of unspoiled wilderness and open spaces are a main characteristic of this biosphere reserve. The yellow-throated sandgrouse (Pterocles gutturalis) is a species of bird in the Pteroclidae family, which is mainly found in the savanna grasslands where it breeds and feeds. It is a monogamous bird that finds and breeds with one partner for the rest of its life. The scientific name ‘Pterocles gutturalis’, the denomination ‘R10’, and the metal value ‘1oz Ag 925 Cu 75’ appear on the reverse. The white-backed night heron (Gorsachius leuconotus) are nocturnal by nature and can be found living individually or in pairs. The most recognisable feature of the white-backed night heron is the pale bare skin, from white to pale yellow or green surrounding its large eyes. 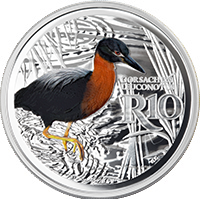 This R10 sterling-silver coin features the White-backed night heron on the reverse, together with the scientific name ‘Gorsachius leuconotus’, the denomination ‘R10’, and the metal value ‘1oz Ag 925 Cu 75’. The orange tritonia (Tritonia nelsonii) is slender and grass-like, reaching a height of approximately 500mm. The beautiful funnel-shaped petals are almost translucent and delicately veined. Orange tritonia occurs in grassland and on rocky outcrops with the orange flowers being quite noticeable during its summer flowering time, among the grasses where it generally occurs. 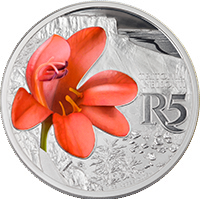 The reverse of this R5 coin features this flower found in grassland and on rocky outcrops, along with its scientific name ‘Tritonia nelsonii’ , the denomination ‘R5’, and the metal value ‘1oz Ag 925 Cu 75’. Crinum is a genus of the large and attractive Amaryllidaceae family, although the Crinum graminicola is larger in stature than most other species of Amaryllidaceae. Grass crinum are herbaceous plants with large bulbs which produce a neck made up of the sheathing bases of the old leaves and are native to the grassy plains of the highveld of South Africa. 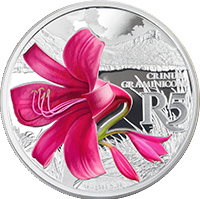 This R5 coin depicts the Grass crinum, along with its scientific name ‘Crinum graminicola’, the denomination ‘R5’, and the metal value ‘1oz Ag 925 Cu 75’. 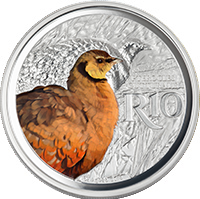 The Prestige set consists of the R10 yellow-throated sandgrouse and R10 white-backed night heron bird coins, as well as the R5 orange tritonia and R5 grass crinum flower coins representing the Waterberg Bioshpere Reserve. The common obverses features a map of South Africa indicating the location of the Waterberg Biosphere Reserve together with the words ‘South Africa’ and the year ‘2018’.